2. In a small sauce pan over moderate heat, melt butter and add flour. Cook for several minutes. 3. Add milk, orange zest, and 1/2 cup sugar. Bring to a boil while whisking constantly. Once it boils, simmer for a couple of minutes and remove from heat. Let cool about 5 minutes. 4. Whisk in the egg yolks, Grand Marnier, and vanilla extract. Reserve. This can be made ahead of time and kept covered in the refrigerator. 5. When ready to make the souffl�s, butter and then sugar 6 individual souffl� dishes. 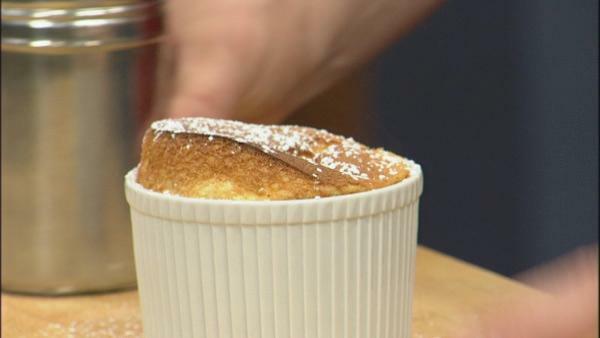 Use 8 ounce straight-sided souffle dishes so that they rise correctly. Set aside. 6. Whip the egg whites in a very clean bowl until they start to form soft peaks. Add remaining 2 Tablespoons sugar and continue to whip until firm peaks. 7. Fold the egg yolk/milk mixture into the egg whites using a rubber spatula and being careful not to over mix and deflate the egg whites. 8. Pour into the 6 souffl� cups being careful not to spill any of it on the side lip of the souffl� cup as this will prevent them from rising correctly. Smooth the tops. 9. Place in oven for about 15 minutes or until they are well-risen, set, but still jiggly. 10. Remove from the oven, dust with powdered sugar, and serve immediately.